Each day I'm amazed at how independent my little Sweet P is getting. She wants to do everything on her own and with as little help as necessary. I love watching her confidence grow as she becomes so much more a little girl and so unlike a little baby. She's just growing so fast and I'm trying to take every moment in. One thing that is totally new is her independence in clothes choice. Her sister-cousin has always been pretty opinionated about her clothes and it's something I've never dealt with. Sweet P usually doesn't care what I put on her and for the most part, still let's me pick out her clothes. However, she is starting to have her own opinions and favorites. She loves anything "cat" so any shirt or pajama with a cat on it gets picked first. When those are dirty, she likes her purple dress or sweater her pappy got her for Christmas. Every now and then she demands to wear the tutu her aunt Ashley made her. If I ask her if she wants to wear it she always says no. I have found that to be true about almost everything. My idea and it's a no. Her idea and it's the way to go. This past week I had changed her after her nap and went to her closet to pick out her clothes. This is what she picked. 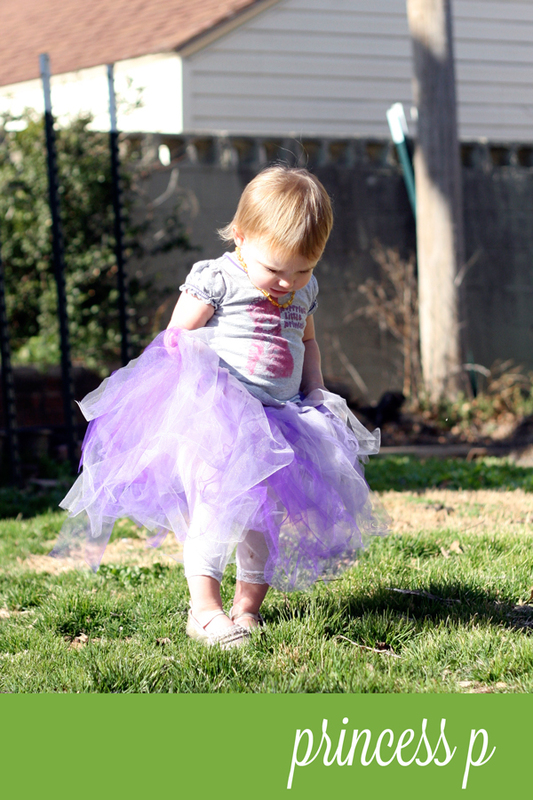 Her purple princess cat shirt and her tutu. She's pretty stinkin cute, if I do say so myself! Kiera definitley has her favorites but doesn't really care what she wears right now. Half the time I will show her a few outfits and have her pick one otherwise I choose for her, and sometimes she picks herself. If it were completely up to her I'm sure her wardrobe would consist of ALL character t-shirts. Love the tutu's color! it is beautiful!